Iain Dale's Diary: Has Carol Thatcher Intruded on her Mother's Privacy? Has Carol Thatcher Intruded on her Mother's Privacy? I'm struggling to decide what to make of Carol Thatcher's book, serialised today in the Mail on Sunday. If my mother had dementia, would I be inclined to tell the world about it in this manner? Probably not, but then my mother is only an iconic figure within her own family, not all over the world. The downside of making all this public is that the media will now obsess about the issue. Up till now, most newspapers and journalists have been quite respectful of Lady T's position and have been careful not to be prurient. I hope the publication of Carol's book will not change that, but I fear otherwise. Dementia is a terrible disease. I've seen the effects it can have on partners and families. It's also a disease that people find embarrassing to confront and talk about. By being open about the fact he was suffering from it, when he wrote his famous letter to the American people, Ronald Reagan did a huge amount of good. Dementia charities were deluged with money to plough into medical research. If Carol's book has the same effect, it will have achieved a positive result. But I can't sweep from my mind the thought that I wish she had kept her counsel. It's as if she has intruded on her mother's privacy. Get real man. If she's that demented, she won't even know she's mentioned in the book. Come to think of it, she won't even know her daughter's written a book. In fact, she probably thinks her daughter is 15. It's her mother, not yours; you have absolutely no right to criticise whatsoever. You disgust me. Just as you have a right to your own warped rantings, I have a right to my own viewpoint, and a right to express it. Typical that you don't put a name to your rancid outpourings. I think you go over the top on your reply to anonymous. I am touched to know that Margaret Thatcher has dementia. It is one of the afflictions of old age. My mother also has dementia and it is not something we keep private although in our case we don't get paid by the Mail on Sunday for writing about it. Carol Thatcher is a journalist and they write about things. Still no follow up on Spellman and her problems. Do you still support her? Silly post Iain. It must be a slow news Sunday for you. It is up to Carol what she writes about her Mother. She is not an idiot and would have thought about the privacy issue. What you have done is given the story legs. You must get over this idolisation of Mrs T and move on. I don't agree with Iain about the tastelessness of the book, so I think I may buy it through his link to his online store. One problem is some modern so-called "comedians" will probably think a suitable subject for their so-called "jokes". This is such terribly sad news about Lady T. Dementia is a dreadful disease, and is afflicting so many [as well as Lady T's friend, and ally Ronald Reagan]. As for Iain’s question about Carol Thatcher – I can only guess as there’s been so much speculation about her mother’s health [such as I’ve heard Lady T has become very forgetful, and apt to repeat herself] – that she felt it was now the right time to reveal what’s really wrong. Let us hope Miss Thatcher is donating some of the money she will make out of all this to a charity dedicated to researching dementia. I tend to agree with Iain that Carol has invaded her mother's privacy. But let us be honest it has been clear for a very long time that Lady Thatcher is not the woman she was which is a great shame both for her and for us. Just think of all the magnificent speeches and public appearances her illness has deprived us of. Tragic! I don't know what you're worrying about. It's respectful, sensitive and loving. Your fears that it was intrusive and exploitative are groundless. Carole Thatcher has easily traversed all those fears by the sincerity of her account. It's revealing to see beneath all the Iron Lady balls there are simple and basic family relationships of reassuring warmth. Contrast with Gordon Brown's domestic arrangements mentioned here and elsewhere on the blogosphere. I think it's important to know that great minds are not immune. That 70% of dementia patients in nursing homes in this country are prescribed antipsychotics, which shorten their lives, wreck their health and turn them into vegetables. What dementia patients need are patience and affirmation, not a kosh to make it "easier" for the nurses. yes, 70%. A kind of living euthenasia. That's what lies ahead, folks. Iain is spot on here. Not only has she intruded on her mothers privacy by revealing both her condition and the extent of it to the world, but she has also taken away some of the dignity her mother had. Margret Thatcher will no longer be the older, dignified "iron lady" (to those without an axe to grind) in her twilight years, but an old ill woman who will be pitied. Given her status and enormous contribution to this country that is very very unfair. If Carol had any sense of honour, of common decency really, she would have kept her bloody mouth shut. However, I doubt that would have sold quite so many books eh? Carol Thatcher is little more than pond scum for doing this. Yes, her parents should feel guilty for having brought her up to have such values. I don't think it's for us to criticise a daughter for writing about her mother. But more importantly, is this an extremely indirect attack on Gordon Brown? By revealing that Lady Thatcher has suffered from dementia for years, surely she could not have known what she was doing when she made her high profile visit to No10? What does it say about a politician, about a man of any kind, that he is prepared to manipulate a frail old woman, possibly against her will if her will was strong enough, for his own personal and politican gain? 30 years ago, believe it or not, it was considered so disgusting to be dying of cancer that victims were hidden from public and all discussion of their condition avoided. Thank God we take a more enlightened view that dying is part of our life albeit sometimes in distressing (for all) circumstances. By highlighting her mothers dementia Carol Thatcher does a service to us all that such problems are best acknowledged and the dignity of the sufferer upheld and not hidden away and made to fell ashamed. Had Lady Thatcher expressly stated that she did not wish this discussed then I am sure her daughter would have respected her wishes. As it is it gives some insight into a sad but not shameful condition that most of us will one day have to confront, one way or another. I hope Carol Thatcher, in so far as she can, has her mother's approval for this - plus as others have said, if she is to profit from this, then a donation to a dementia charity is the least she can do. That said, anything which raises the profile and sympathy for those who struggle with dementia has to help. Given the extent of Mrs Thatcher's symptoms, it also makes Gordon Brown's staged publicity coup with her last year, more obviously exploitation. Agree with Andy actually. I knew Lady T had dementia, and was more than somewhat surprised when she popped up on Gordon's doorstep. She would not have had a clue that she was being manipulated. Incidentally, the best brains seem to be more at risk of developing dementia. Harold Wilson, Ronald Reagan and Iris Murdoch spring to mind in the public domain. When I was doing a bit of weekend work in some nursing homes, I noticed that the victims had been at the top of their game when healthy. Bank Managers, Heads of departments in schools and universities, generally intellectual folk. My aunt developed it in her late 70s. She was a keen historian. We should not keep it under wraps. It is enough of a cinderella illness as it is. Has Lady Thatcher actually been diagnosed with dementia, or are her problems the result of brain damage caused by her strokes? From what I have read today her symptoms are very similar to those of my late father who had 2 strokes late in life. Dementia was specifically ruled out by the gerentologists who examined him. Dad had been Geography teacher and lecturer but he was then even unable to draw 3 o'clock on a clock face when asked. Like Lady Thatcher his short term memory went - he could not remember if he had had lunch. He could not learn new skills like taking his pills at the right time, using a microwave or video/CD/DVD recorder. He also regressed emotionally, becoming like a difficult, needy 3 year old. He would obsess on trivia - collecting newspaper coupons, never sending off for the goods but getting very upset when we threw out old out of date coupons. He could however perform old learned skills like shaving and dressing with no problem. Not only was his recall from years ago fine, but he could talk lucidly and intellegently on subjects that had interested him in his life - The Romans, French literature, Milton, Alpine glaciation etc. He even gave lectures in public and answered questions from the audience with no difficulty! In spite of Dad's short term memory and other cognitive difficulties he was acutely and tragically aware of his situation -which naturally upset him. I can't think he would have been happy to read about his problems in the Mail on Sunday. 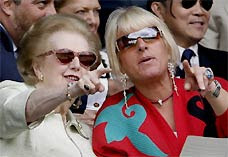 Love the picture of Thatcher next to Jimmy Saville. Got to agree with Annabel H about that Downing Street visit. I thought that it was pretty obvious that Mrs Thatcher was suffering from this tragic ailment. I can't understand your problem with Carol Thatcher being open about it Iain? She was not just the leader of the Conservatives and our PM for 11 years, but she was also a mother. I admired Reagan and the author Terry Pratchett for speaking openly about their illness, it will bring much comfort to others similarly afflicted as well as their families. I can think of no one else who would be more respectful or caring in the way that they talked about it other than her daughter Carol? She wrote a very touching book about her father which I enjoyed reading immensely, and I have no doubt she will do the same for her mother. I also think that Carol's actions and comments with regards to her mother in recent years have been extremely helpful in reminding those that had forgotten just why she was such a great lady and leader of this country. I hope she regrets not making more effort to liberalise the clinical trial process or just make them cheaper for untreatable diseases. The politicians are told to avoid it as the doctors know best and any change in the law could backfire. The reality is that there are plenty of safe shortcuts in the details. My mother didn't have dementia, but if she had I would never have humiliated her by writing a book about it. Carol Thatcher must be desperate for money. "Taken away her dignity" Oh please! It's been common knowledge for years that Maggie has dementia. All Carol has done is shed a little light on the awful trauma the condition brings. By the way, torymory, my father's mind went, in what sounds like a similar way to Mrs T's, and the doctor's diagnosis was vascular dementia caused by a series of mini-strokes. Oooh get Dale. Happy enough to take a few quid to discuss Thatcher's funeral if it helps his own media career, but heaven forfend a member of Thatcher's own family discussing her health. I should imagine that Carol had her mother's agreement to this during her more lucid moments and would have consulted amongst Maggie's circle. It's common for public figures to use close friends and family to signal to the wider public - particularly as Maggie has been warned off making speeches or giving interviews. It seems a very sympathetic and carefully worded piece revealing the kindness and support from Thatcher's family. I echo the comments that this is sad for Britain - robbed of her continued contribution to the national debate - as well as a personal tragedy. I think that Carol Thatcher has done exactly the right thing in the circumstances.Her mother is an exceptional public figure and would otherwise be harried by the media even if there was announcement that she wished to retire completely from public life. Now Carol can concentrate purely on the comfort of her mother's closing years. has Carol Thatcher intruded on her mother's privacy? No, and think perhaps you ought to pause before wading into this. One might justifiably ask in turn how Carol and rest of her family feel about self-appointed bloggers debating whether or not her mother should have a state funeral, while she is still alive? Petard 4.16am. Just for your information I waived my fee for that broadcast. what's the fuss about? Carol's just following her mother's dictat - sell everything for the best price you can get. Thatcher took very real dignity from more folk than anyone can be bothered to count, and her policies denied lots of folk the care that they needed when they were vulnerable. iain, you may find this disgusting, but her family will afford her the care she needs. she did not ensure that for her fellow citizens when she was in office. it is difficult to feel sympathy. She is only doing what John Bailey did and got lots of praise for doing and which made him lots of money. I totally agree Iain. My mother is 86 and has Alzheimer's so I know what the daughter is going through. However her Mother is a great World Leader. I have never heard of Carol Thatcher as a great journalist or anything else. Journalism, in our time, is a sleazy profession, and this proves that any one of them would sell their own mother. If Margaret Thatcher were not her mother, no one would give a hoot, or a dime for her "memoirs"
Carol Thatcher is perfectly entitled to write this book. On reading about this in the Mail on Sunday I found it quite heart breaking to learn that what a cruel illness this is, and how it is destroying a brilliant mind. It was brilliantly written also! With regards to the clunking fist, I dont think he intended to exploit Maggie, but it was a very calculated move, and was certainly meant to embarrass David Cameron. This obviously spectacularly backfired on him, as going forward it will be very hard for his party to continue some of the vile, nasty left wing attacks that some have made on her. As always you get the lefty losers showing no compassion to her. Get a life!!! If she was so wrong about everythig she did in power, why has your "oh so caring" labour government made so few changes to many of her radical, fundamental changes she made to this country. A great lady who did her best. She had more integrity in her little finger than Broon and Blair. Making money from other people's misery. Why aren't you applauding her? Its a difficult one. I am currently experiencing this in terms of a close relative. There is certainly something to be said for demystification and honesty about the issue. Its pretty clear now that Harold Wilson resigned as the early stages of Alzheimer's became apparent. Nowadays, the way that his very swift decline was kept secret by the press certainly wouldn't be respected. So, perhaps its better that Carol Thatcher tells the truth as she sees it. Oh, and for the record, I loathe and despise Thatcher, everything she did, believes in and stands for. Dementia is a disease that knows no boundaries. It is blind to the categories in which we usually place our fellow human beings. It can occur at the age of 55 or 85. It can happen to Blacks, Whites, Hispanics, Asians, Jews, Christians, Muslims, males and females, rich and poor. It will not spare ex-presidents or ex-prime ministers. It did not spare my mother. Tears are shed by husbands and wives, sons and daughters, brothers and sisters—in fact anyone responsible for the care of a loved one with dementia. Carol Thatcher's book will help all such wonderworkers understand that they are not alone. Her mother would want it that way.